At the risk of stating the obvious, Anglo-Catholicism in North America is faced with a challenge. Namely, to create a distinctly catholic integrity within the emerging new Anglican Province, ACNA (Anglican Church in North America). Is such a thing possible or even desirable? Some argue that it’s not, given ACNA’s predominantly evangelical ethos and the fact that six of its twenty-eight dioceses ordain women to the priesthood. But this is surely precipitate; the Province is a federation and has the constitutional space to allow a catholic network within itself. This already exists, albeit informally, in the form of the dioceses of Fort Worth, Quincy, San Joaquin and Forward in Faith’s missionary Diocese of All Saints. These now have the opportunity to create a greater union in which the fullness of the Church’s teaching on Faith, Order and Morals is upheld and practiced. Is this possible? Yes, inasmuch as the constituency in question genuinely believes in its catholicism, and to that extent the effort is desirable. It is always a good, worthwhile and holy thing to build God’s catholic Church; this issue of Forward in Christ explores some of the issues and potential outcomes surrounding this endeavor. But lest we forget, our particular brand of catholicism, worthy though it be, is a small part of a very much larger religious picture and we cannot afford to ignore or distance ourselves from our Roman Catholic and Orthodox brothers and sisters. It is biblically imperative that we strive for the unity that Our Lord prayed for and which, in the end, is the underlying reality of the Church herself. Likewise, the undeniable growth of a militantly anti-Christian culture and state lends the utmost urgency to realizing Christ’s will that we “be one”. A disunited christendom is not only a scandal to the world and an affront to the Gospel, but is also fatally weak in the face of forces that hate and seek to destroy the Faith. It is undeniably the case that Pope Benedict and the leaders of Orthodoxy understand the nature and extent of this threat and are working to meet it. We must do the same, or risk submersion and ultimate irrelevancy in the rising tide of secularism and contemporary godlessness. Forward in Christ unequivocally supports this cause as we continue to strive for the increase of God’s Church and that part of it which He has entrusted to us. May He bless that work. Proclaiming the Faith and Order of the Church, given to us by Christ. 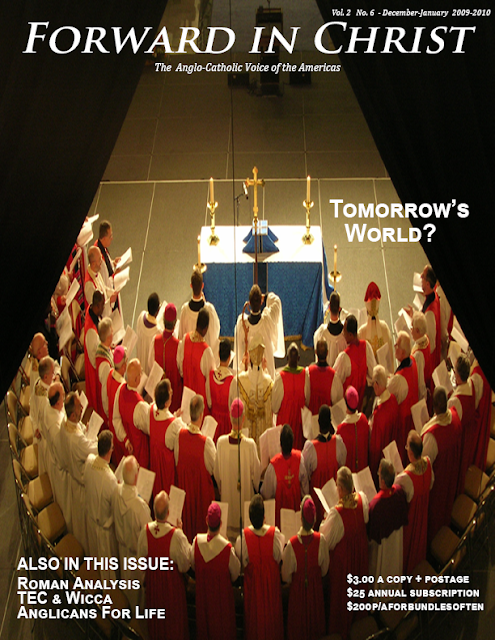 Forward in Christ is the magazine of Forward in Faith North America, asserting catholic orthodoxy for our part of God's Church. Follow Forward in Christ by email.